At the recent Empire State Producers Expo, Chuck Bornt of the CCE Eastern New York Commercial Horticulture Program, presented the “Fresh Market Potato Variety Round-up,” discussing the nearly three dozen potato varieties tested in 2018. “Up until 2016, I grew five acres of potatoes. Now I grow 34 varieties in trials,” Bornt said. The farm where the varieties were trialed is Barber’s Farm in Middleburgh, Schoharie County, NY. He explained that during the last growing season the farm aimed to grow two trials, one organic and one conventional. However, the summer’s rain in eastern New York presented a soggy issue. The conventional seeds were planted on May 17 with 40 inch row spacing and nine inch in row spacing. The plot length was 50 feet, and the number of hills planted per variety was 65. The conventional trial was completed on Nov. 24, but they were unable to finish the organic trial due to the weather. Varieties were divided into white skins, red skins, yellow fleshed, russet lines and specialty lines. Their total marketable yield was counted and graded by size (chefs being greater than three inches, A’s greater than two and a half inches and B’s greater than two inches). They were graded on Jan. 4 and Jan. 9, 2019 – “and we cook and eat all of these, so it takes a while,” Bornt laughed. Another notable variety was the red-skinned NDAF113484B1. “This one really stole the show,” Bornt said. It had an overall smaller yield than Chieftain, the variety used as the standard, but NDAF113484B1 was comparable in the ratio of graded chefs and A’s. 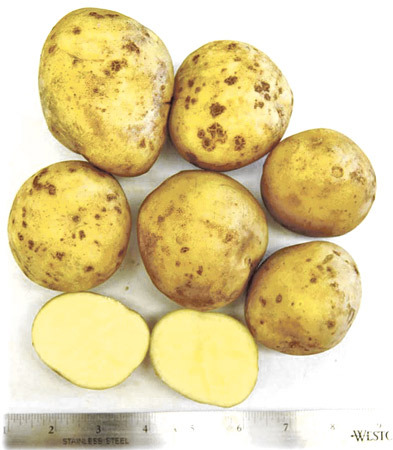 “Shape is nice; skin has a little texture to it due to silver scurf; good size; we need to look at this again; may have a good disease package” stated the observations on this variety. As for the yellow-fleshed varieties? Work still needs to be done to find the tuber that will unseat Yukon Gold as king.